An interesting thing happened during yesterdays iPhone launch and it wasn’t just observing Robert Scoble’s mastery of self promotion (in a good way of course). Thousands of people* who were not lining up for an iPhone, be that because they simply weren’t interested in doing so or as in my case were unable to due to geography, experienced the highs and lows of iPhone day vicariously through live streams. The day wasn’t without issues, Kristopher Tate’s Zooomr/ Ustream feed had technical issues at times, but on the whole the experience was something special. From the interviews on the street, through to the screams of those entering the Apple store to applause, through to the first addition to America’s Funniest Live Video Streams 2020 when Tate had his credit card declined. The difference on iPhone Day was that instead of turning to blogs or waiting for the mainstream media to report the facts hours later, we were all able to watch it all in first person. The promise of user generated live media was delivered. The seed of a revolution was planted. Lifestreaming has been covered before on TechCrunch; I remain unconvinced about the likelihood of Lifestreams such as Justin.tv (the man, not the service) being anything more than a niche pursuit, yet what we saw on iPhone Day was different: this was Eventstreaming. Eventstreaming is the missing link in Web 2.0’s challenge to network television. Who could ever forget the coverage of the London Bombings in 2005 where user generated video featured as a main source of footage. Two years later and the technology has continued to improve; the step from recording footage of an event to streaming it live over the internet has been made. 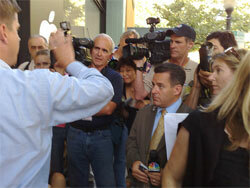 Events can be outside of the control of the person recording the event, such as the iPhone launch, or staged. I’ve found myself tuning in to Chris Pirillo’s Live feed. Pirillo hosts a live tech show most nights and at times can have hundreds of viewers. It’s a staged event, but an event none the less. In these cases events have a bigger pull than lifecasts; time is too precious for many to watch Justin on Justin.tv driving a car but like actual television, we can and will find time to watch a staged event, or a stream of a non-staged major event such as the iPhone launch. Of course, it would be absurd to suggest that tomorrow thousands will begin Eventstreaming, but there is already a factor at play that will drive the field: exposure. As Robert Scoble knows, the best way of promoting your brand (and in Scoble’s case it is Scoble himself) is to be there and be seen. Compare and contrast Zooomr to Mahalo. I caught a reference in passing, buried in one mainstream media report on an iPhone queue that the team from Mahalo were queuing for the phone. The direct benefit to Mahalo of the exercise, aside from Jason Calacanis now having 5 iPhones to give away? Not much at all; a mention in a newspaper or two at most. By comparison the Zooomr logo and brand were exposed to thousands (maybe even more) watching the Eventstream on Ustream, many of whom may never have heard of or used Zooomr before. Money could possibly buy that exposure, but it is well a truly beyond the reach of most. In marketing terms it was pure brilliance, and it will not go unnoticed. The first wave of Eventstreaming will be driven by smart startups who know a good thing when they see it, and who can’t afford to buy this sort of exposure any other way. Eventstreaming is the difference between just being there, and being seen. (* my understanding of the Ustream feed from watching a discussion Kris Tate had with some one from Ustream was that the stream itself was delivered over multiple streams and that as a consequence the counter on the live stream I was watching did not reflect all viewers, only viewers to a particular stream. At the time the phone went on sale the feed I was watching had over 1000 viewers, an overall figure for those having watched was in excess of 40,000 according to another figure on Ustream).